As catamaran sailors we may have little awareness as to what goes on behind the scenes to ensure the quality assured parts we need to order or the new boat we buy are ready when we want them and why should we? While we are out sailing, the supply chain of replacement parts and boat production is continually ongoing in the background. It is the role of Windsport as licensed manufacture to work with Bryher Mouldings (owners of the Dart 18 and Sprint 15 product) to ensure the many individual parts are manufactured to the correct quality and tolerance. This is a continuous process and Ian Fraser, one of the founder members of Bryher Mouldings, is a valuable cog in ensuring the original quality control standards are still meet today working in partnership with Windsport. This working partnership means the continued investment by Windsport ensures the future supply and production of new boats and their parts meets the quality and tolerances required. Regular random selections of parts are inspected and checked by Ian himself, hence the desk full of Dart and Sprint related regalia. When a part requires updating or modifying Ian is involved in the process of working with the manufacture and the class to provide a solution. With new technologies moving on Ian is also in the process of digitising all the class drawings and manufacturing specifications making it quicker for Windsport to access the information and for future re-tooling and production to be updated. The Windsport team are located at Mylor Yacht Harbour, near Falmouth, Cornwall, UK. 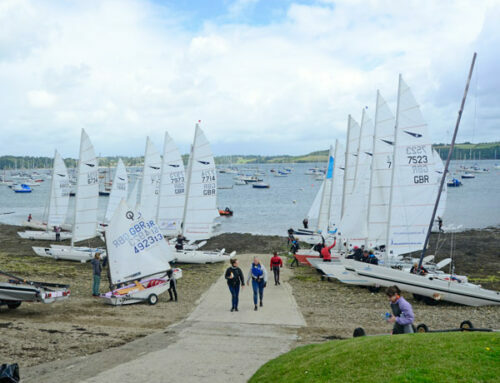 We have a fabulous sailing location here with plenty to do an see outside of the centre. All catamaran sailors are always welcome to visit Windsport, sail from our shore and share our joint enthusiasm for catamaran sailing. Contact Windsport for anything and everything to do with catamaran sailing.